In Google Chrome there isn’t an easy way to view stored passwords for websites. Therefore, in order to recover lost passwords you need to use third party softwares. I’ll list a few that are easy to use and are light on resources too. ChromePass is a tiny password recovery tool that helps you to view the user names and passwords stored by Google Chrome Web browser for different websites. For each password entry, the following information is displayed: Origin URL, Action URL, User Name Field, Password Field, User Name, Password, and Created Time. It doesn’t require any installation; all you need to do is just double click and run it. 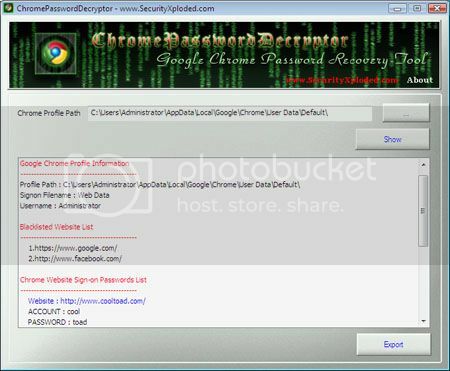 Chrome Password Decryptor is a powerful utility to recover Chrome passwords. It decrypts the passwords and shows them in clear text. The best part is that it can even display the usernames and passwords of those sites which you have chosen Google Chrome not to remember. Just like ChromePass, Chrome Password Decryptor also doesn’t require any installation. All you need to do is just download and launch it. To save or backup all the login details you can use the ‘Export’ option. What is Google Redirect Virus? How to Remove Google Redirect Virus?